With the fresh local asparagus season just starting, the first thing on my list to make was the asparagus soup with morel mushrooms and ramps that I enjoyed so much last year. Unfortunately I was not able to find any morel mushrooms but I knew the soup would taste great even without them and besides, this time I wanted to try roasting the asparagus so there would be even more flavour from that. 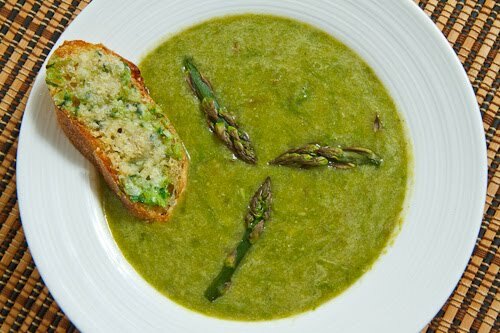 I was thinking that just a bowl of asparagus soup was a little light even for a light meal and I thought that some garlic bread, which is my favorite side for soup, would fill it out a bit. I had some ramps left over form the soup and I thought that the fresh ramps would make a great substitute for garlic in a “garlic” bread. One bonus was that if I included the ramps leaves then I would not need to add parsley to the “garlic” butter to add some green. The ramp garlic bread turned out so amazingly well! I really enjoyed the sense of freshness that the ramps had over the garlic and it went really well in the bread and the bread went perfectly with the asparagus soup. Mix the butter and ramps. Spread the ramp butter the slices baguette and sprinkle the cheese on top. Broil in the oven until the cheese is melted and the crust is golden brown. If I can't find asparagus do you think I could use chicken legs instead? Or maybe the thigh?? What wold you suggest? I love garlic bread, but home made is key, 'cause the store bought one are so bland. Your version is a far cry from bland!! This looks fantastic. I can think of about a thousand things that this bread would be tasty with. Just the sound of garlic bread is making me drool right now. It looks so lovely alongside that soup! The garlic bread sounds like a great side for the soup! What a pretty dish! Still never tried ramps…that bread looks fantastic.